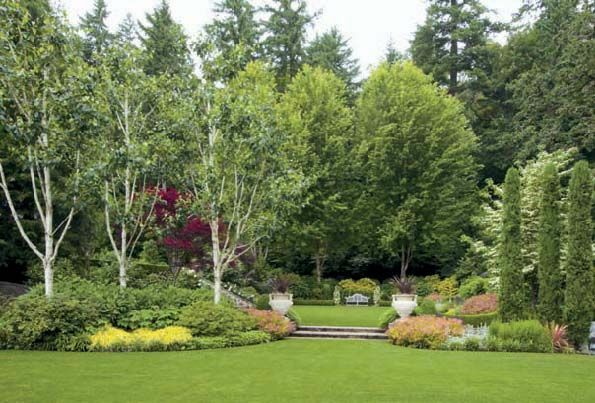 When landscape architect Larry Cavender began work on this garden, he had two main charges: create a handsome entry from the front of the house and its motor court into the lower garden, and restore the compacted soil to something that would actually grow a plant. 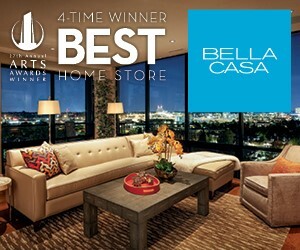 All of this has been accomplished, plus framing Lake Oswego views with inventive plantings and paving. The low hedge separating swaths of lawn use two colors of boxwood for a festooned effect, similar to ironwork on the house. 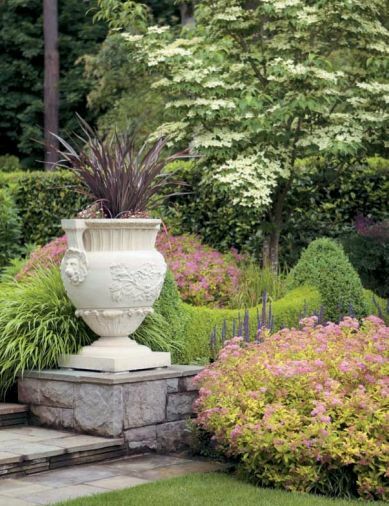 Golden Japanese forest grass softens harsh edges and corners, and pink spirea provides a burst of long-blooming color. 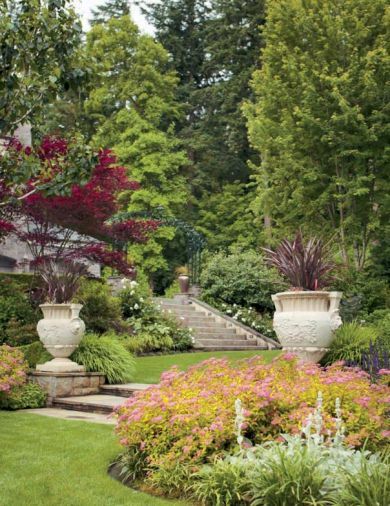 Jacquemontii birches with stark white trunks see their color mirrored in stone urns that flank broad stone steps from the upper to the lower lawn abutting the lakeshore. Another trio of trees, this time columnar Italian cypress, provide a formal contrast to the birches. The Geary home greets visitors with understated French chateau details, like the arching of the windows and the delicate tracery of the dark green ironwork. These curves and materials are repeated throughout the garden – this isn’t a garden for just anyone, it goes only with this house. Boxwood and topiary are seen again in the larger garden, and even in the intimate courtyard, accessed from the motor court, which features a charming fountain designed by Larry Cavender. Cavender used bluestone paving throughout the Geary garden, which unifies the surfaces of the existing serpentine stairway and the loggia. All of the new ironwork in the garden is created by the same company, Dyadic Ironworks, inspired to match the railings and balconies on the house, increasing the unbroken continuity. When the bluestone near the pool is wet, it is the same color as the lake on a cloudy day. Pavers outlined and separated by sod can be mowed easily, and reduce wear and tear on high traffic areas. Plants are used instead of more typical garden art to provide living sculpture throughout the garden. 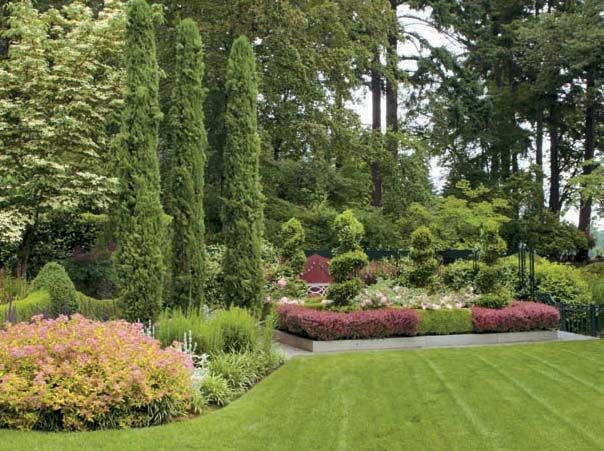 Large trees were left in place to link to taller Douglas firs on surrounding lots, and a purple-leafed Japanese maple is easily traced against the house and brighter green surroundings. A knot garden of seemingly interwoven boxwood, and barberry, backed by a screen of corten iron and steel mesh housing evergreen star jasmine provide a barrier to the neighbor’s driveway. The color of the barberry is echoed in the rusty iron partition, and will be further emphasized when the red fountain grass in the urns blooms from mid-summer until the first frost. 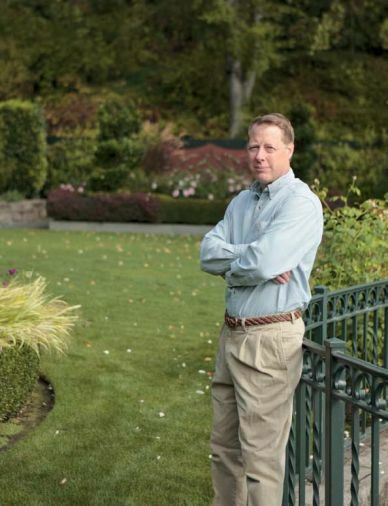 Landscape architect Larry Cavender, ASLA, in the Lake Oswego garden he designed. 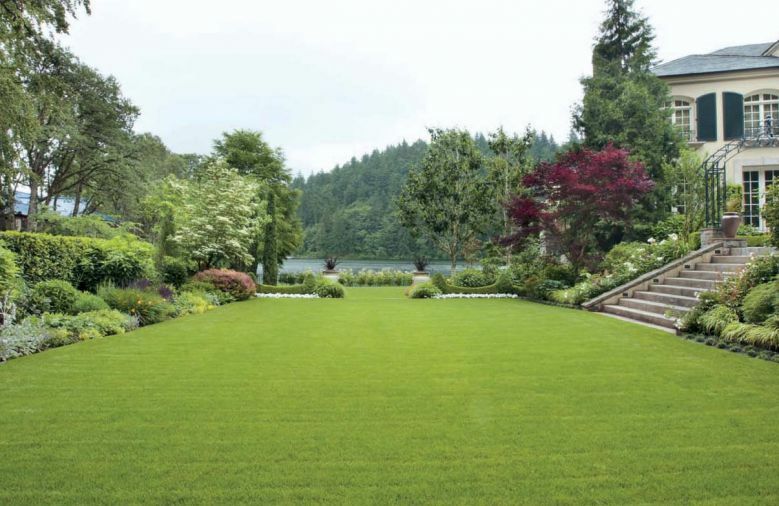 When Larry Cavender, ASLA, was hired with a design and build firm to update the garden for this Lake Oswego client, an initial job was to engineer a drainage system that would allow the soil in the lower garden to breath and hold nutrients to support a formal garden with a varied plant palette. In 1999/2000, when Cavender began his association with the property, soil around the house had been devastated by years of construction and remodeling. The coming and going of workmen and their heavy equipment had compacted soil already saddled with a high water table. Although tons of blended soil amendments had been brought in to make a garden, it had settled and suffered as the house was renovated. The house is reminiscent of a simple French chateau, not ornate, but featuring slightly arched windows bracketed by broad, very dark green shutters. The surface of the home is faced in stucco, and the mullioned windows are placed to open up the interior to the outside views, whether facing the lake or the garden. Although this is a relatively new home, the feeling of permanence provided by the basalt foundation and terracing is lightened by the wealth of windows. Once the soil problems were improved, Cavender could begin the much more enjoyable task of linking the garden to the house and the greater landscape. Creamy stone urns mark the two broad steps that bring us down to a wider expanse of lawn that edges the lake, and these are connected to the broader landscape by two low swag-style boxwood hedges of Buxus sempervirens ovals in dark green joined by festoons of brighter yellow-green Buxus sempervirens ‘Suffruticosa’. The hedge mimics ironwork shapes on the house, stylishly connecting home and garden. The plinths and stairs are the same bluestone and basalt used throughout the garden. The importance of balance and interplay between the house and garden can best be admired standing at the edge of the lake, looking back into the garden. The bold pale trunks of a trio Jaquemontii birch (Betulis utilis var. jacquemontii) are given a contrasting partner in three Italian cypress (Cupressus sempervirens ‘Glauca’), which please the eye by providing an equal number of trees but dramatically varying the texture. The columnar cypress do not block the view of the flowering dogwood, and if we look carefully at the boldest elements in this panorama of plants and accents, it becomes clear that the milky birch trunks, the light beige urns, and the dogwood all compliment the color of the house, creating a visual line that unites the home with the surrounding natural environment. Starting with large specimens allows the garden to compete with surrounding Douglas firs, helping the garden gain the appearance of maturity and belonging. The house is approached by more linking elements, low basalt walls capped with bluestone, and foundation beds edged with formal boxwood, echo the geometric configurations that greet us as we enter the motor court. 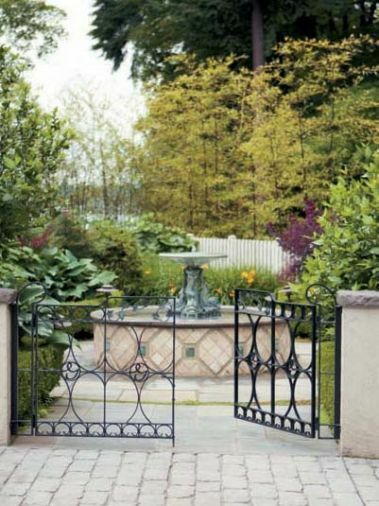 Occupying an otherwise wasted space to the right is an inviting gate into an intimate square, with a fountain designed by Cavender. The surround is tile and limestone, accented with bronze medallions, and the tri-form dolphins are made of lead, with their tails raising the limestone bowl. The powder-coated steel gate, created by Dyadic Ironworks, is the same color as the house shutters. Let’s consider this little fountain and its placement for a moment. 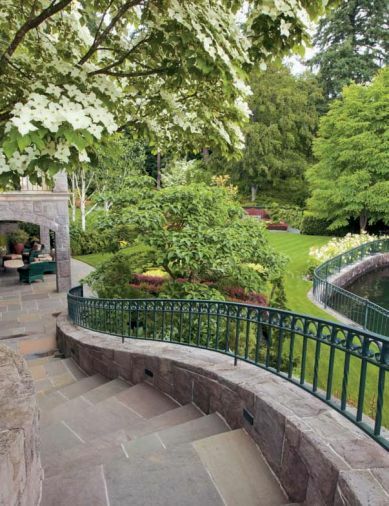 A water feature placed anywhere else on the property would compete with that most impressive water feature out back, Lake Oswego. Any created stream or waterfall would pale in comparison unless it was large enough to totally dominate the garden and distract from the lake view. However, in the little street-side courtyard, the fountain’s splash masks most road noise, and beckons us in for a moment’s relaxation upon arrival at the house. 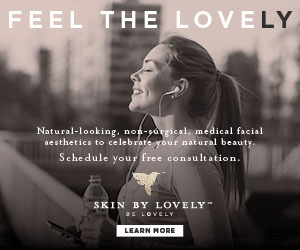 This is a case of less being more. A mere six feet in diameter, the fountain is scaled to its space, and the walk around the fountain and the plantings that fringe the fence and walls avoid any sense of crowding. The serpentine bluestone staircase descending the back of the house takes us from the upper pool to the lower garden. A tiny lap pool was expanded by new owners into a larger rectangle in better scale with the house, and Cavender suggested the random squares and rectangles of bluestone be added to ease wear and tear on the lawn as one travels from pool to spa or from house to lakeside balcony. Any standing water runs into the outlines of grass, so water and mud are kept under control. Throughout the garden Cavender has used a wide selection of plants to serve many functions. Not only do repeated foliage and flower colors tie the house with the garden, but conifers and leafy evergreens serve as formal sculpture, and the texture contrasts serve to let us know when we are changing areas and elevations. Plants like ‘Windemere’ roses in soft white, are used to outline and soften steel railings, and using white shortens distances visually, enabling long vistas to appear less imposing. Yellow flowers and foliage can have the same effect. Dark-leafed plants, such as a Japanese maple, are used judiciously, and must be placed near companions that will enhance them – like the white-trunked birches – or else they become invisible. A skilled landscape architect must also be an efficient problem solver. One of the areas used by previous owners as the grandchildren’s play yard (hence even more compacted soil) opened onto a neighbor’s driveway. Although most of the garden boasts a lung-filling expansiveness, this problem area needed a quick privacy fix, and there was no room for hedging. Cavender turned a liability into an asset by converting the former playground into a unique garden feature, a knot garden in a raised bed. Raising the soil level was accomplished by turning bluestone pavers on their sides, and adding nearly sixteen inches of a freshly amended soil blend. The knot is composed of boxwood and dwarf barberry. Rather than opting for the usual central focal point, four spiraled wax-leaf privets mark the corners, their placement formal but their form whimsical. ‘Bonica’ roses were added inside the knot for nearly perpetual three-season color. Suddenly one is drawn to an area that had been an eyesore. The privacy is provided by an iron screen flanked by panels of powder-coated steel mesh, which evergreen star jasmine (Trachelospermum jasminoides) climbs enthusiastically. The iron screen is a laminate called Corten, where a rusting surface of iron is sandwiched over a core that will not rust through. Artistic detail has been added by tendrils of copper vines aging to green, a motif used to enhance other steel features throughout the garden. Privacy is achieved, and a feature with subtle details is added, too. Although it appears that Larry Cavender has solved all of the problems of this garden, his relationship with it is ongoing. Any gardener will tell you that rebuilding and replenishing soil is an ongoing part of garden preservation. Each year he re-evaluates the plantings, with a maintenance team of bed specialist Aimee Simard, and Alix Henry, who manages lawn care and ongoing garden construction projects. They are trying new roses as needed, removing trees that are encroaching beyond their allotted space, or discussing where they might be thinned, and making sure that the visual connections to the house, garden, and lake continue to be enjoyed as a seamless whole. Q: WHAT PLANTS ARE CURRENTLY INTRIGUING YOU MOST? LARRY: I’m enjoying learning more about ornamental grasses. I like the textural counterpoint and punctuation they can provide. My taste in plants is very broad, and I don’t think of myself as having signature plants I always use in every project, although I love Acanthus mollis (Bears Beeches) for its structural leaves and flower spikes, and for its ancient history as a design motif. It is the leaf shape seen on top of Corinthian columns. New penstemon [Beard-tongues] varieties have also recently piqued my interest. LARRY: For plants that are going to be a major focal point, buy the biggest specimen you can afford, so that the plant can start fulfilling its role as quickly as possible. Also, don’t skimp on the craftsmanship of man-made elements like arbors, pergolas, and water features. They should have beautiful details and be built to last. If you can have them custom designed, then built elements will always look right, because they’ve been made just for you. An example is the entry arch from the motor court to the lower lawn in the pictured garden. The ironworkers were careful to replay the design elements of the railings and balconies already on the house, so now we have a wonderful structure that serves as a proper announcement, “You are entering a garden!” I like helping clients prioritize what they want their garden to be. 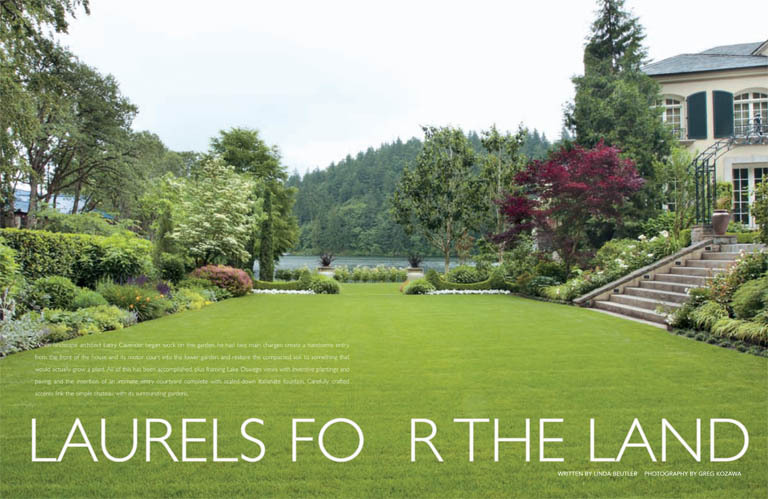 LARRY: Part of my job sometimes is to direct people away from gardens they’ve seen in magazines or visited that would be inappropriate for their site or wouldn’t go with their home. Or to help them modify what they like into what will work. 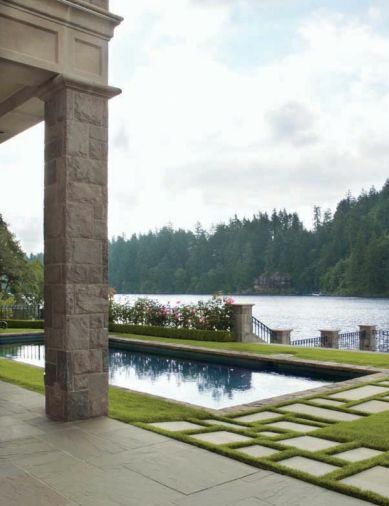 For example, on this home, any water feature couldn’t help but compete with Lake Oswego, it’s right there. Nothing would work because no built water feature could compare. But the little fountain in the front courtyard does work because there is no view of the lake, and the space buffers the house from the road. Q: WHAT IS YOUR FAVORITE PART OF YOUR OWN GARDEN? LARRY: My home is in John’s Landing, and my garden is eclectic. This last autumn I installed a low stairway using wide iron flat bar for the risers, and back filled it this spring with beige granite chips to tread on. I welded screw eyes inside the flat bar, and drove rebar through them into the ground to provide support. We back-filled with quarter-minus gravel and let it settle through the winter, then topped it up with several inches of the granite chips this spring. It is a contemporary look for my 1906 house, but I really wanted to try this construction method. The iron is slow to rust, and I’m really happy with the look of it. Q: DO YOU HAVE FAVORITE PUBLIC GARDENS TO VISIT?